Please allow me to introduce myself by giving you a biography of myself to date. I have been training retrievers since 1974 for fieldwork. 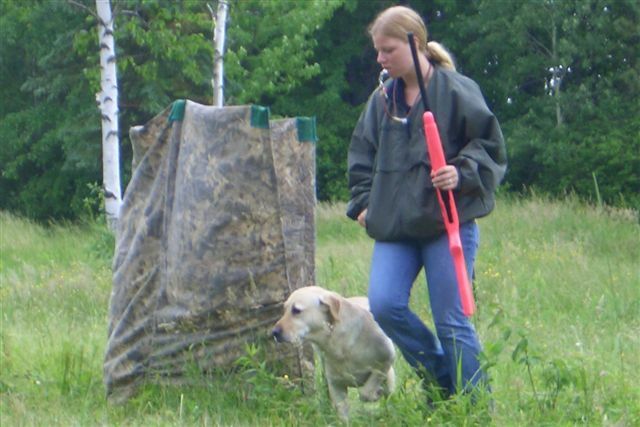 I trained my first dog to be Qualified All-Age in Field Trials in the U.S. and Canada when I was just 14 years old! I became interested in training dogs by being exposed to it by my parents (Van Lee Labradors) who have bred retrievers for fieldwork since the late 1960's. They not only bred Labradors for fieldwork, but they were also competitive with their dogs in AKC and CKC Field Trials while I was growing up. It was my parents who taught me the beginnings of training retrievers. After learning as much as possible from my parents and their training partners I pursued training with different people, both professional and amateurs. By doing this I was able to gain more knowledge and experience. I continue this practice, even today, to keep learning and improving. The sharing of information is invaluable. In 1980 I had the opportunity to become an Assistant to a Professional Field Trial Trainer in California, Dana Brown Istre. I worked with Dana and her husband, Grady, for a little over a year assisting in the training of many dogs who were FC's and/or AFC's or who later gained those titles. This is where I learned the "basics" of the e-collar program and had the opportunity to train with people like Rex Carr, Jim Dobbs, Judy Aycock, Patti and Rick Roberts and many other successful "dog people". I have trained many different breeds of dogs for obedience and have trained numerous retrievers for hunting. 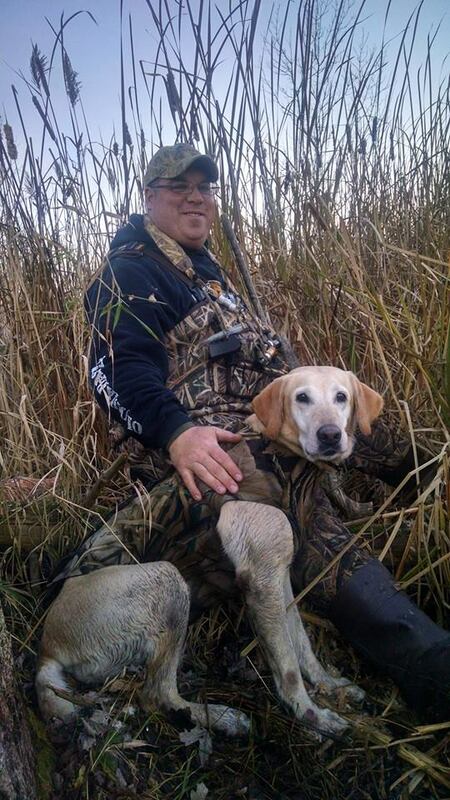 I now continue to train some dogs for obedience, but my primary training is for clients who hunt their companions on waterfowl and upland game. I encourage my clients to get involved in AKC or NAHRA Hunt Tests and handling their own dogs at the events, however, I do enjoy running Hunt Tests and offer my services to handle your dog if that is preferred. I enjoy teaching both people and dogs the skills needed for an obedient, well-mannered companion whether they enjoy hunting together or if they want to participate in AKC and/or NAHRA Hunt Tests. Training the dog is only half the "team"- having the dog work and perform with his or her owner is what, I believe, makes the training complete. 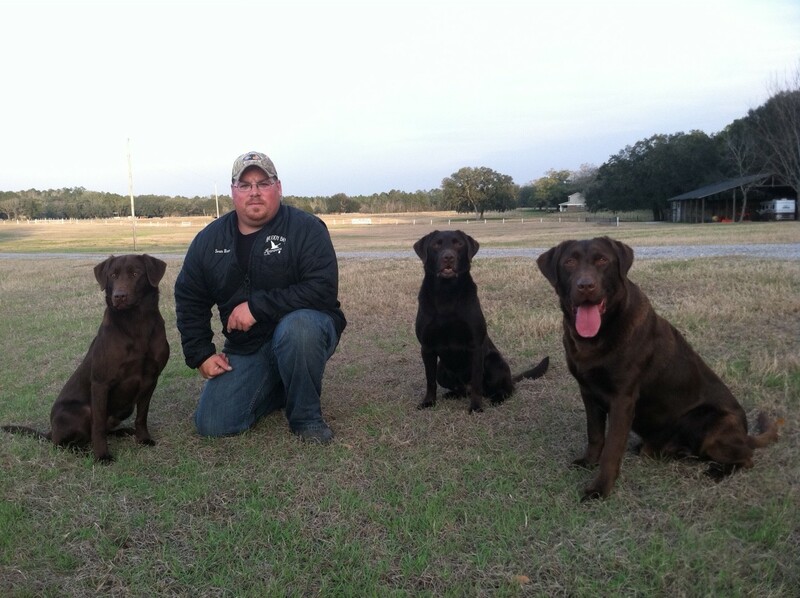 I have TITLED numerous dogs in all 3 stakes of the AKC Hunt Test program. I qualified four (4) dogs for the 1999 Master National and passsed three (3) of them in the 1999 Master National; qualified and passed one (1) in the 2000 Master National; qualified and passed one (1) in the 2004 Master National, Van Lee's Travel'in Man which put him in the Master National Hall of Fame. I also train my own dogs for AKC Field Trials and have made three (3) dogs Qualified All-Age. I truly enjoy what I do and believe that maintaining a dog's attitude is an important factor during training. Although this is work for the dogs and work to train them, it must also be fun and enjoyable for the owner, trainer and the retriever! 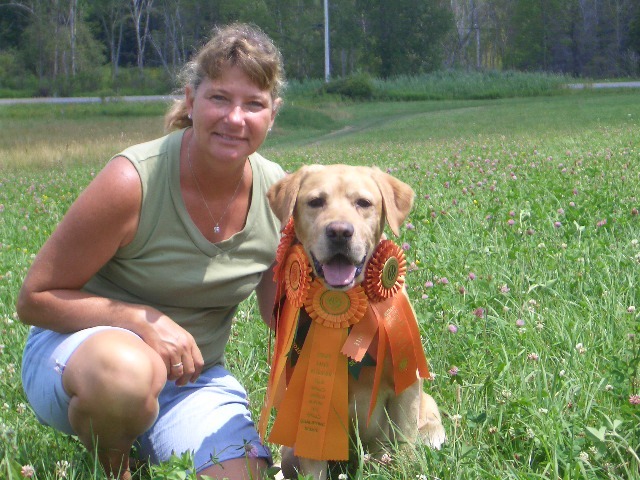 Since I was eight years old, I have enjoyed working with dogs with my mother, Tammy, training retrievers for hunting and all-breed obedience. I began training my first dog, Lazer, to be run at the Junior level of an AKC Hunt Test when I was just 9 years old. Lazer had a lot of the basic training when I "took over" but I enjoyed training and working him. I learned a lot while achieving his AKC Junior Title. Excited and anxious to move on, I continued training and working with Lazer. By the springtime following his earning his JH title we both were ready for the Senior Stake. This involved teaching him double retrieves, steadiness, sitting on a whistle blast and hand signals. As I worked Lazer through the Senior Tests and titled him I assisted in training and handling other dogs in Hunt Tests to gain experience and improve my training and handling skills. While titling Lazer and training/handling other dogs I was invited to participate in ESPN's Great Outdoor Games Big Air Competition held in July of 2000! I trained and competed in this competition with Lazer. I trained Lazer for this by thowing bumpers off a dock and sending him for them. The jump off the dock was measured from the end of the dock to where the dog's back legs touched the water. The dog that had the farthest jump (Biggest Air) won!! In the end we came in 7th place, I was the youngest handler at only 12 years old, and I was satisfied and proud of Lazer and truly enjoyed the experience. For a couple of years I didn't have a dog to run in hunt tests but I continued training dogs with my mom. I decided in the spring of 2001 that I wanted my own dog to raise and train. In July of that year I got my first dog, Skeeter. I spent as much time training him that fall and winter as I could so we would be ready for spring AKC Hunt Tests. I began running him in the spring of 2002 in the Junior and titled that summer. As I did all of the training on him, I was very proud of myself and Skeeter. In 2004 Skeeter earned his Senior title and in 2006 he became a Master Hunter. I have also hunted pheasants, ducks and geese with Skeeter. 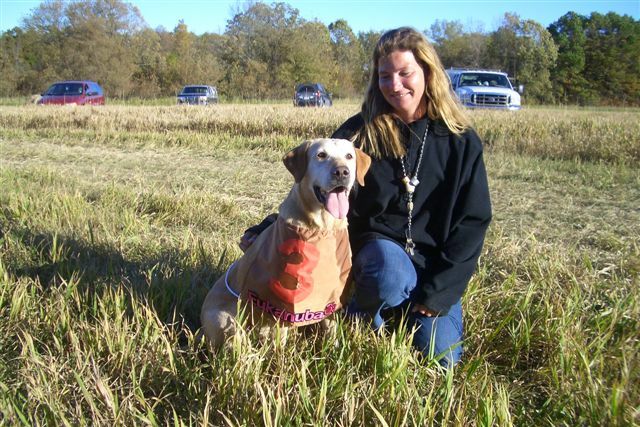 I worked for my mom, Tammy, assisting her in training dogs in a "bird boy" capacity until May of 2005. At that time I became her Assistant Dog Trainer taking direction from her in working with all the dogs. We are now training partners. I have TITLED numerous dogs in all stakes of the AKC Hunt Test Program. I quailfied and passed the 2011 Master national with one dog, qualified and passed the 2013 national with two dogs and qualified and passed the 2014 national with one dog. I also won the Qualifying Stake in AKC Field Trials in Jan 2012. I enjoy teaching dogs the skills necessary to become enjoyable hunting companions and progressing them from young pups to "working retrievers"! I have also trained several dogs in "basic obedience" they have become "good citizens" and are pleasant to have around. I thoroughly enjoy training dogs and running Hunt Tests. I travel to warmer weather in the winter training in different areas which is also great for the dogs! They experience different fields/cover and all kinds of water. While doing what they love - Retrieving!!!! It is great to train the dogs and see them progress from day to day - I can truly say "I love my job"!!! I am from Port Clinton, Ohio, and own Muddybay Retrievers. Since I have moved to Chaffee, NY, I have been training jointly with my wife and mother-in-law of Peak Performane Training I am a member of Avery Outdoors Pro-Staff, Team Eukanuba, and Field Proven Calls Pro-Staff. In 2003 I was very fortunate to meet and train with an experienced field trialer who helped me learn the ins and outs of competitive retriever training. I continue to watch, listen, and learn from successful trainers, using skills from each of them to develop my program for retriever training. I have trained numerous dogs to all three levels of AKC hunt tests Junior, Senior, and Master, including my first retriever, Drake Hager MH who earned his AKC Master Hunter Title by the age of 3. Training dogs for some of the biggest names in the waterfowl industry like Fred Zink of Zink Calls and Clay Hudnall of Field Proven Calls is something I take great pride in. 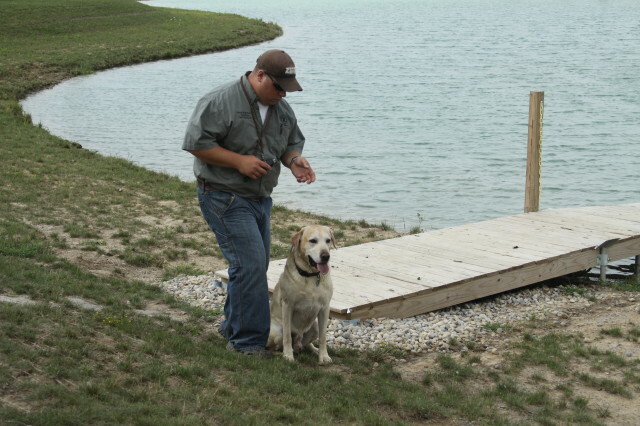 I enjoy to work with people and their dogs to help them develop the skills needed to be successful in the field.